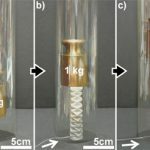 These new prototype robots, which were molded from paper and silicone rubber, can twist, bend, grip, and lift more than 100 times their own weight. The more astonishing fact is that they run on pneumatic actuators, which means that they basically run on air. The DARPA-funded project imagined “soft” robots for specific tasks in which they might perform better than their metallic brethren. Examples include running through a winding tube, rubble, or other tough environment that might be problematic for a robot made out of metal. 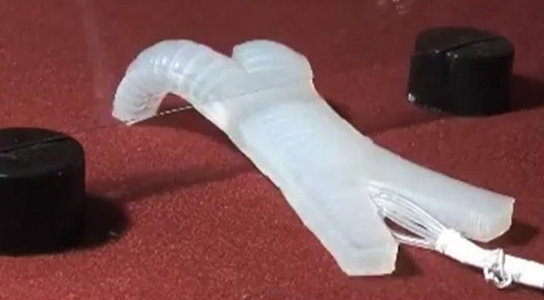 Xin Chen, a chemist at Boston University, and part of the team that published their research in the journal Advanced Functional Materials, says that these robots will be quite flexible, which is something needed in some environments. Engineers have been looking at insects, birds, snakes, fish and dogs for inspiration. They’ve developed air-powered rubber robots that can constrict like snakes and undulate under obstacles. The new prototypes go even further by using paper, fabric, and wire mesh to add strength and definition to the silicone-molded shapes. Once they’re molded, the devices are hooked up to a simple compressed air source, like a syringe. After they’re molded, the devices are hooked up to a simple compressed air source, such as a syringe. In order to accomplish tasks, the robots need to be folded in just the right way. They’ve demonstrated how a crinkled up clump of silicone-soaked paper was able to lift a 2-pound weight. The force required to accomplish this task was roughly twice that of a human exhalation. The researchers’ armamentarium also includes cylinders that blow into spheres, tubes that act likes springs, and compact stacks that turn into rigid pies or rings. The next step involves adding wiring and electronics to add more functions. In principle, these devices could be scaled down to a micro- or nanoscopic scale. 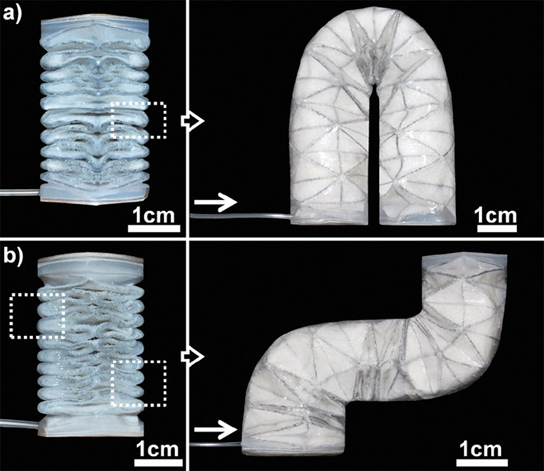 Be the first to comment on "Elastomeric “Soft” Robots Running on Pneumatic Actuators"